Class Sets are available for schools only. To add a Class Set, your school must use a supported authentication method. Select Class Sets from the Shop drop-down menu. From here, you can browse featured Class Sets or use the search bar to find a specific title or author. Your search results will only include titles available as Class Sets. If you'd like to add a Class Set, select a term length for your title (if there are multiple term options), then click Add Class Set. Authentication name. This refers to how your users sign into your school's OverDrive collection. Select the option that's closest to your school name. Note: If you want to assign your Class Set to users under multiple authentication names, you'll need to purchase separate class sets for each authentication name. Distribution & terms. This is the term length and price per student for the Class Set. Start date. This is the date when you want the title to be automatically checked out to your users. If you select today's date as your start date, the title will be automatically checked out to your users within 3 hours. Email address(es). Enter the email address(es) for yourself and any staff members who should be notified when this Class Set has been checked out to users. Please enter each email address on a separate line. User IDs. Click the Add user IDs button to enter user IDs for everyone who should receive the title. Please enter each user ID on a separate line. Note: If none of the assigned user IDs have signed into your school's OverDrive collection, you won't be able to add the Class Set. In this case, sign into your school's OverDrive collection with one of the user IDs, then try adding the Class Set again. Once you've filled out all the required fields, click Purchase Class Set. Review the summary of your class set terms, then click OK to continue. Note: Class Set purchases and checkouts are final and can't be reversed. On the "Confirm your class set purchase" page, read and confirm the purchase conditions, then click Complete purchase. On the Class Set's start date, the title will be automatically checked out to each assigned user, and any admins you entered in the "Email address(es)" field will receive an email reminder. 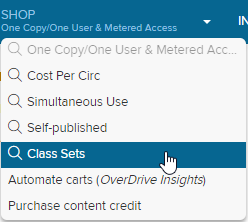 On your school's OverDrive website, class set titles appear under Account > Checkouts.